The world’s worst dictators, human rights abusers and largest arms firms will gather behind closed doors in Britain this week at a government-backed arms fair that supports repressive regimes, a leading campaign group warns. The two-day Security Policing Conference and Exhibition will be hosted in Farnborough, Hampshire, South East England. It will kick off on March 10, with the press explicitly excluded. News of the arms fair surfaces as Britain reportedly approved the sale of £16 million worth of anti-riot equipment, including tear gas and rubber bullets to countries on its own human-rights blacklist. Critics say the British government is prioritising profits over human rights. Organized by the Home Office, this week's arms fair in Farnborough will focus on the sale and promotion of military wares commonly deployed for“state repression,”according to Britain's Campaign Against the Arms Trade. Delegations from a slew of repressive regimes are expected to attend. Although the invitee list is yet to be publicly disclosed, CAAT suggests it will likely contain representatives who have frequented similar events. Among these are delegations from Saudi Arabia, Bahrain, UAE, Colombia, Qatar, Libya and Algeria. CAAT carries out research into the global arms trade and its devastating impact worldwide. It seeks to raise awareness about the destructive effect arms dealing has on security, human rights and economic development at home and abroad. The campaign group suggests UK military equipment may have been deployed during repressive crackdowns and human rights violations in Bahrain, Egypt, Kuwait and Hong Kong. It says these allegations would never have surfaced were it not for the work of journalists and activists located on the ground in these regions. CAAT’s Andrew Smith says the arms fair in Farnborough undermines the British government’s claims of promoting human rights abroad. He warns the event will ultimately serve to bolster and strengthen repressive governments. 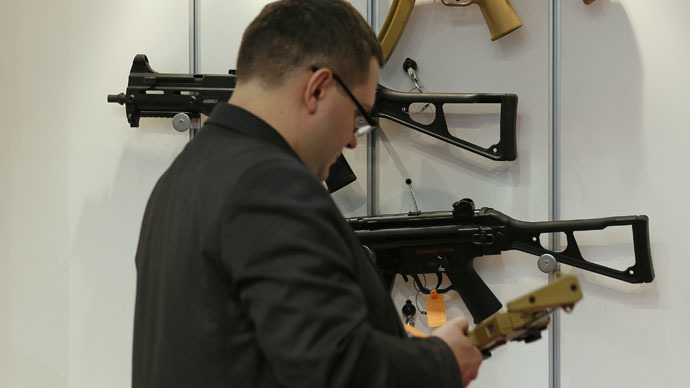 Last year, visitors attending the arms fair in Farnborough were presented with the exhibition stands of weapons manufacturing giants BAE Systems, Thales, Finmeccanica, Heckler & Koch and others. Surveillance firms like the Gamma Group and The Hacking Team were also present, according to CAAT. BAE Systems is Europe’s largest arms firm, and has supplied many repressive governments, such as Saudi Arabia’s, Bahrain’s and Mubarak's Egypt. Thales is the eleventh largest arms firm in the world, and has also sold military wares to some of the most oppressive regimes across the globe, CAAT says. RT asked the Home Office on Monday whether it acknowledges the arms fair in Farnborough will serve to strengthen repressive regimes abroad. “A thriving security industry is vital to help cut crime and protect the public and so it is important these products and services can be showcased and expertise shared,” she said. It stressed all states, territories and organizations attending the event as guests of the government were approved by the Foreign Commonwealth Office. In February, pregnant political activist Anne Marie O’Reilly quietly entered a glitzy arms industry dinner in Westminster, commandeered a microphone and warned assembled arms dealers and MPs that profit derived from“death and destruction”is unacceptable. Her unexpected intervention left the crowd somewhat stunned. Before being escorted off stage, O'Reilly suggested arms dealers in the audience should reconsider their careers. The annual dinner, which cost attendees £246 per head, was hosted by ADS – a trade body for British Aerospace, and other defense, security and space companies. Shortly before the ADS dinner, it emerged the Prince of Wales allegedly wishes to end his role as a promoter of British arms in the Middle East. The revelation was unveiled by an unauthorized biography documenting Prince Charles’ life, published in February.